I have another 5 plants to ID. I am thinking that this is definitely a weed. Look nice, but is it a weed? I'm no good at this but here is my tuppence worth. I'm also not an expert at this but the leaves on No 2 look remarkably like hazel to me? We will have to wait for Silversurfer to correct us. At least we got in before her, then maybe she is giving us a chance at last. 1. I believe this to be Skimmia. Possibly one with male flowers only. Cannot make out any stigmas. 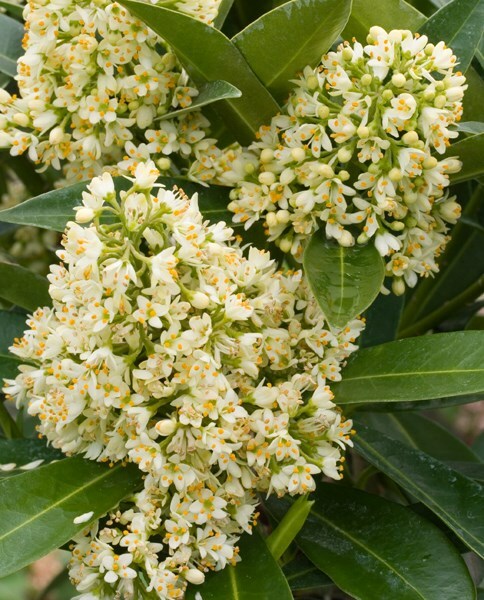 Such as Skimmia confusa Kew Green. 2. Looks like Alnus glutinosa. Common name Alder...are there any nearby.? 3.?... would like to see the flowers. 5. Looks like Tanacetum parthenium aureum...Golden feverfew. Does 5 not at least look like celery? You can't eaaaat feverfew cous. I only grow what I can eaaaat! And I had celery last year that was the spit of that picture. I know a few lads who should have bowl of them beside the bed to give the mrs on occasions!!! Why is the fault always with the male?